ECB President Mario Draghi said Europe's recovery is still at risk and needs continued support. The European Central Bank forecast Thursday a slow economic recovery and repeated its pledge to keep interest rates low as it waits for more evidence that the upturn will be sustained. The ECB said it expected GDP in the 17-nation eurozone would shrink by 0.4% in 2013, compared with a previous forecast for contraction of 0.6%. The revision is in keeping with data showing a stronger-than-expected return to growth in the second quarter and encouraging signals from surveys of business activity and confidence. But speaking to reporters after the bank decided to keep interest rates at their record low of 0.5%, Draghi reiterated that they would remain at current levels or lower for an extended period to support the "slow pace" of recovery in output. 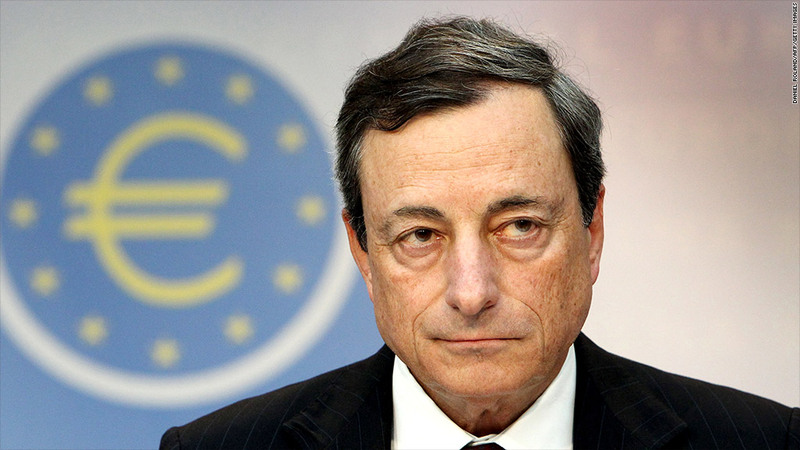 "I am very, very cautious about the nature of this recovery," Draghi said. "The shoots are still very green." Risks to the bank's economic outlook were still tilted to the downside, he added, pointing to recent declines in government bond prices and emerging market currencies, the risk of higher oil and commodity prices due to conflict in the Middle East and weaker than expected global demand. The ECB also trimmed its forecast for GDP growth in 2014 to 1.0%, down from 1.1% in June. Ken Wattret, head of European economics at BNP Paribas, said Draghi had struck a clearly dovish tone. "That the guidance leaves open the option of lower policy rates is nothing new but the 'feel' of the statement and the question and answer session afterward gave the strong impression that the ECB not only maintains a bias to ease but wants to convince markets that it is willing to act," he wrote in a research note. Earlier, the Bank of England also decided to keep interests rates at 0.5% and the volume of its asset purchase program, aimed at stimulating economic growth, unchanged at £375 billion. The U.K. economy has shifted up a couple of gears in recent months as activity in manufacturing, services and construction has accelerated, presenting the bank's governor, Mark Carney, with a dilemma. Related: Don't trust your central bank? Bet against it. Faster growth and talk that the U.S. Federal Reserve may begin scaling back its bond-buying program as early as this month have pushed up yields on U.K government bonds. Many economists now expect Bank of England rates to rise as early as 2015. But Carney said only last month that the bank won't raise interest rates until the middle of 2016, because it will take that long for unemployment to fall to below 7%, guidance that is being viewed with growing skepticism by investors. The bank issued no substantive comment with its decision Thursday, possibly reflecting division among its policymakers as to whether the guidance can hold or not.